How Does Your Teenager Use The Internet? – Should You Care? McAfee Inc., a well known and respected provider of antivirus software and intrusion prevention solutions, recently released new research which indicates that most American mothers rate their teenagers’ online safety, their exposure to drugs and drunk driving, as essentially equal anxiety producing agents. So, are these mothers concerns justified? You bet! While it’s true that the Internet can provide a rich educational and cultural experience for children, and teenagers, it is virtually impossible for them not to be exposed to, as my Internet friend Rick Robinette, the owner of the Web site, What’s on My PC, a recently retired Law Enforcement specialist puts it, “the underbelly of the internet”. The sad reality is, contrary to the myth that we have raised, or are raising a “tech savvy” generation – the majority of children, and teenagers, are undereducated when it comes to recognizing the dangers, and threats, that the Internet poses to their personal privacy and safety. Consider this – would you drop off your child, or teenager, in a neighborhood where more than half of the buildings were adult stores, and which was potentially full of predators? 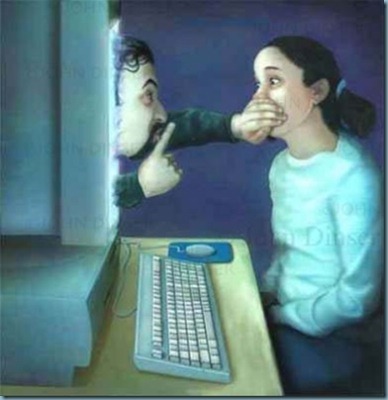 In my view, if you allow your child, or younger teenager, to interact with the Internet unsupervised, or without having communicated to your child information concerning potential on-line dangers, this is what you may be doing. I found the most surprising and troubling statistic to be; 16 per cent of the teenagers involved in the McAfee study, indicated they had developed social networking profiles and Email addresses, which they had hidden from their parents. So what’s a concerned parent to do? According to the FBI in the United States, the following are some of the most important positive actions, you as a parent, can take to reduce your child’s possible victimization on the Internet. An important aspect of ensuring that your child is safe while using the Internet, (recommended by child safety experts/organizations), is the installation of parental control software. ParentalControl Bar, a browser toolbar, is one solution provided free of charge, by WRAAC.org, a non-profit organization dedicated to providing free, and effective Internet control tools. You can download this application from the developer’s site. Check out my review of this free application on this site “Free Internet Child Protection – Parental Control Bar”. For additional information on monitoring your child’s cell phone usage (most cell phones today are really Internet connected devices), see “Parental Monitoring And Cellular Phones” by my tech wizard friend TechPaul. It is hard for me to come up with an “Internet-related” topic more important than this, and you have done a masterful job of presenting this very useful information and advice. I think it should be required reading before a “Internet Surfers License” (an ISL) is issued. It is clear that most people simply do not grasp the fact that the Internet is for the most part unpoliced and unregulated — literally, the “wild, wild, West”, and as you put it, “a (cyber) criminal’s playground”. My opinion is, people prefer to think of it as a clean, well-lighted public library.. or fun place like Disneyland. You are doing a real service here; and I, for one, applaud you. both mom and i are very cognizant of our 9 year old girl when she uses the computer. as of now, she is allowed to use my laptop which is protected and she shares a login with mom so we can keep tabs on the internet history. the carrot in all of this is if she can use the net responsibly, she gets her own login. something that all us geeks look forward to! fwiw, one of the best tools for her surfing is WOT. it is so easy to tell her not to go to the yellow and red sites. also like the real time protection for the just in case clicks. You’re a very cool Dad! Another winner of an article! I commend you for drafting an article of such importance. I just completed a “link back” article to this one to get this information out. I think that articles such as this are of priority to us all. Like you, I feel this is an issue of major importance.